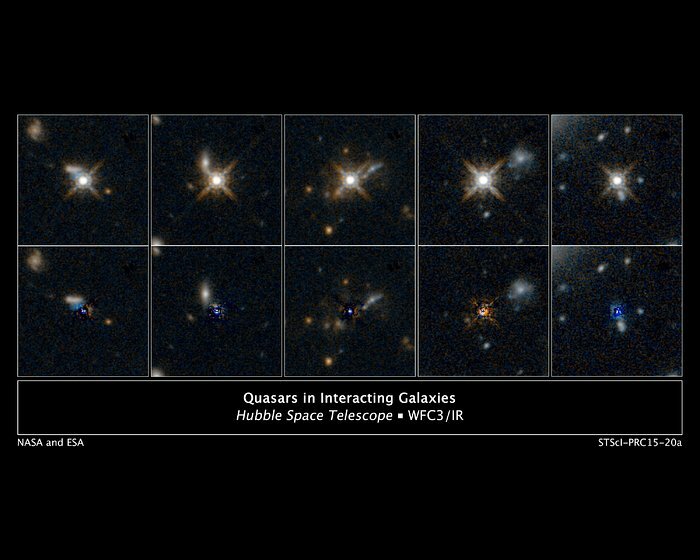 This is a selection of photos from a Hubble Space Telescope survey of 11 ultra-bright quasars that existed at the peak of the universe's star-formation era, which was 12 billion years ago. The quasars (powered by supermassive black holes) are so compact and bright they make a diffraction-spike pattern in the telescope's optics - an optical artifact typically only produced by bright nearby stars. Despite their brightness, the quasars are actually dimmed by dusty gas around them. The infrared capability of Hubble's Wide Field Camera 3 was able to probe deeply into the material around the quasars. When the glare of the quasar is subtracted, researchers see evidence for collisions between galaxies. The collisions and mergers gave birth to the quasars by fueling the supermassive black hole at the core of the galaxies. The new images capture the dust-clearing transitional phase in the merger-driven quasar birth. These observations show that the brightest quasars in the universe live in merging galaxies.